The waning phases of the Moon are a good time to evaluate and assess our experiences of the waxing phases. We’ve got a lot to unpack from the first two weeks of this lunar cycle: a solar eclipse, a lunar eclipse, and a Venus eclipse. All these events happened in the mutable signs of Gemini (air) and Sagittarius (fire). If you feel like a lot of energy has been stirred up these last two weeks, you are right! In my own spiritual practices, I often set a conscious intention in the New Moon phase of the lunar cycle, but not always. Having a fair amount of mutable energy in my own chart, I don’t like to saddle myself with too much form. And through years of working with the lunar cycle as a way to hone my awareness, I’ve noticed that sometimes the really important lessons of a lunar cycle are not around my intention at all. Sometimes my mysterious allies have another intention for me. With so many momentous astronomical events happening, it may be that your mysterious allies had another plan for you too. Relationship—Venus is moving retrograde and this invites us to go deeper into our patterns of relating. Learning—all the emphasis on Gemini invites us to experience our minds in new ways, to notice the impact of mind on body and soul, and to seek wholeness through a piece of truth or insight. Meaning—the lunar eclipse in Sagittarius stimulates the desire to enfold our diverse experiences into one big story of Truth. Have you found yours? Compassion—Underneath the stimulating energy of Gemini and Sagittarius, Neptune and Chiron in Pisces have asked us to traverse the terrain of the heart. Opening to feelings is not a safe experience, but we have the opportunity to develop our heart muscles for the future. Sunday, June 10. I invite you to get in touch with the real sky. Tracking the appearances and disappearances of the planets deepens our experience. In mid-May, Mercury disappeared from the morning sky as it was overtaken by the rays of the Sun. Just like Venus, Mercury has been changing positions in the sky. Today, Mercury returns to being visible in the evening sky at sunset. This transition signals a change in how and why we use our minds. Morning star Mercury has a more logical focus and evening star Mercury, a more intuitional focus. How are you noticing this shift in yourself? Mercury will be climbing into greater visibility at sunset over the next few weeks. Astrologer Gary Caton says this phase of Mercury is about seeking meaning for what has occurred since Mercury disappeared. Tune into your intuition now. 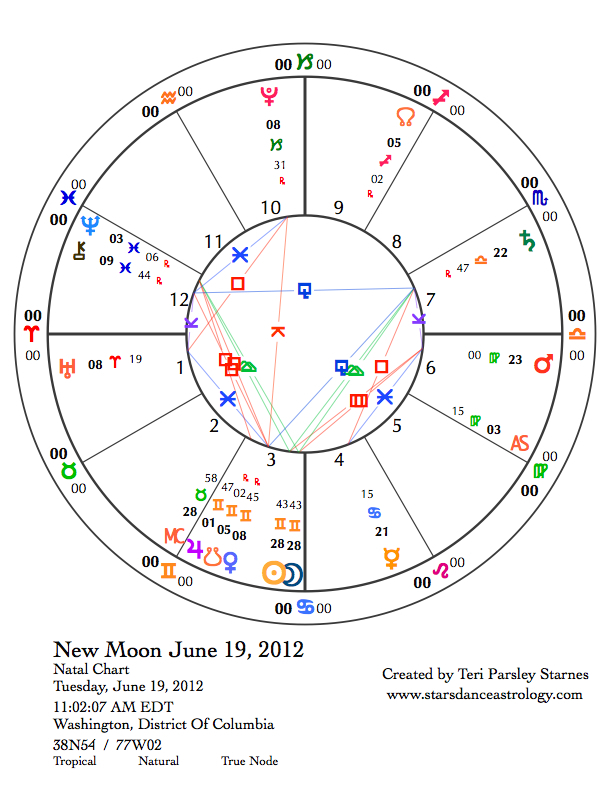 The Moon is in Pisces from today thru most of Monday, June 11, helping us to do just that. June 11—Last Quarter: Evaluating. This could be a mind blowing day. This phase of the Moon is about adjusting our attitude. The Moon in Pisces squares the Sun in Gemini and this invites us to adjust our mind/heart balance, or what we might call the air approach and the water approach to life. Often we put these qualities on different sides of the fence. What happens when we remove the fence? Two planets*, Jupiter and Chiron, pull us in each direction today. *Chiron is actually more like a minor planet. Jupiter enters Gemini today and remains there for the next 12 months. This particularly potent Gemini Moon cycle has seeded Jupiter’s transition into Gemini. The Lovers card in the Tarot corresponds to Gemini in the Golden Dawn system. This card shows polarity and unity. The pulsation back and forth from these two points of view is a strong Gemini theme. Over the next year, we are invited to notice this pulsation. This dynamic colors the world and forms much of what we think is true. We get a chance to look at our styles of thinking and perceiving. The ruler of Gemini, Mercury is activating the square between Uranus and Pluto today. As the forces of change and transformation kick into gear, perhaps we can take this day to notice how our mental attitudes play into the possible fear of or desire for radical change. To counter this mental action, Chiron stations retrograde today in Pisces. This shamanic energy takes us deeper into our hearts, patiently waiting to receive what we are ready to heal. Mercury plays a role here too in a harmonious trine to Chiron’s position for the next two days helping us to integrate this broad range of expression and understanding. Tuesday, June 12. The Moon in Aries today joins with Uranus in the very nearly exact square to Pluto in Capricorn. Whatever Mercury stirred up the day before continues into today. Here’s an interesting polarity to investigate: action and reaction. When are you most aligned with your own values—when you dare to take action, even if you are afraid, or when you are reacting to others? What feels better to you? Wednesday, June 13. The Sun and Moon contact Saturn in balancing Libra today. How do you regain your balance? What takes you out of balance? The Moon in Aries opposes Saturn. The actions and reactions of yesterday come home to roost. The Sun supports building firm foundations that encourage balance in our lives. Thursday, June 14. Let’s take this day to listen to our bodies. The Moon is in Taurus and there is a pause in the action of the transits earlier this week. While still in the “evaluating phase” of this lunar cycle, remember to listen to the wisdom of your body. What physical adjustments help you to make the attitude adjustment you need to make to really move forward? June 15—Balsamic Moon: Surrendering. With the Moon still in Taurus, we move into the letting go phase of this cycle. Are you resisting letting go of an idea, a truth, a way of understanding your world? This is pretty mystical stuff. What is left when you surrender your assumptions? Saturday, June 16. This week began with Mercury emerging from the Sun’s rays into the evening sky. It ends with Venus emerging from the Sun’s rays as the morning star. There is beautiful symmetry in the sky right now. Venus will be quickly climbing higher and higher in the morning sky before sunrise. Mythically, Venus has traveled through the underworld into a seed moment when she transited the face of the Sun. Now, she returns with news to share! Significantly, the news is colored by a square between Chiron and Venus today. Chiron is the initiator. Venus has journeyed far, and right before her return, she meets the shaman. Many transits this week emphasize the relationship between mind and heart. Today’s meeting takes us back to that terrain. In true Gemini fashion, as I sit down to write this week’s forecast, I’ve got about four things going at once. Dandelion seeds are a wonderful metaphor for Gemini energy. The barest movement of mind sends the seeds dancing into the air. This is the dance of life, Shiva’s dance—spinning and weaving invisible potentiality into concrete manifestation, then back into invisible potentiality, and so on and so on without end. The world is in transition right now. Many sense that things cannot go on as they have but there is not yet consensus on where we need to go next. Ideas, states of being, emotions are all up in the air, like those seeds. Some people really like this kind of energy, the mutable types, others have a harder time with it, the more fixed types of people. There is no right or wrong, but it is good to be aware of your type and tend to your needs as Shiva dances us through change. A lot is happening this week in the skies—important things to note and integrate in the ways that work for you. But be aware: overload is possible. It is good to simplify our lives and minds so that we can invoke joy, balance, and compassion into them. Sunday, June 3. Early this morning,* the Gibbous Moon moves into Sagittarius, preparing us for the partial Lunar Eclipse that occurs the next day. In a sense, that is what the Gibbous Phase of the Moon is all about, preparation for the illumination and release of the Full Moon. How do you work with anticipation? What is coming next? Will I like it or hate it? Perhaps that type of attachment diminishes what we can experience at this time. How do we stay present and unattached to outcome? That may be the clue to reaping the most benefit from this day. Mercury in Gemini and Saturn in Libra are the allies to call upon for this intention. They are in a strong, harmonious trine with each other. If Mercury represents the mutability of mind and desire, Saturn represents the firmness of intention, especially in ways related to balance and relationship. 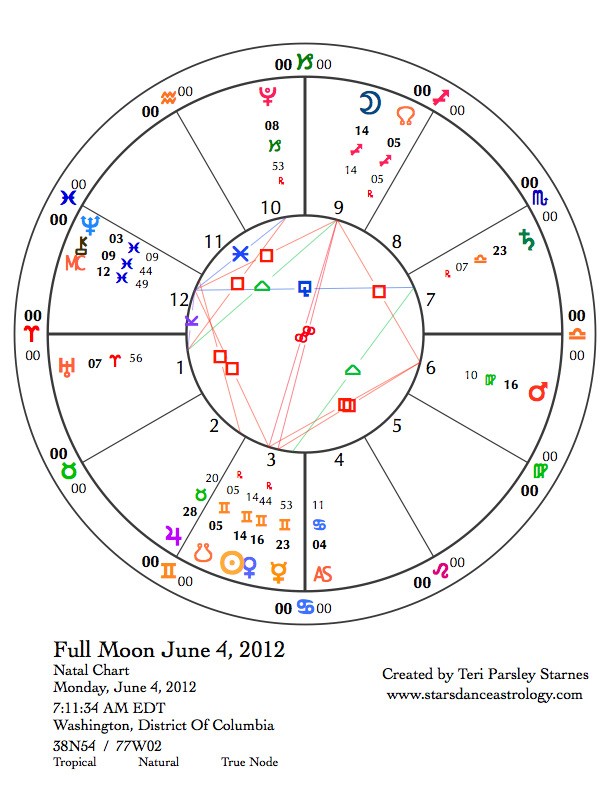 June 4—Full Moon: Illuminating. Lunar Eclipses happen at the Full Moon phase when the plane of the Moon’s orbit and the plane of the Earth’s orbit line up with the Sun. An eclipse intensifies the already dynamic relationship between the Sun and Moon. 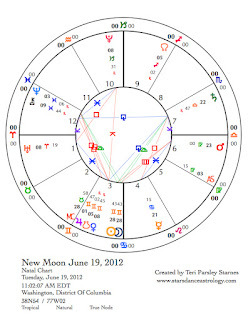 There is a lot of aligning this week, as Venus, Earth, and Sun also align for a rare Venus transit of the Sun on June 5. This week you may want to use this image as you open to your own alignments. 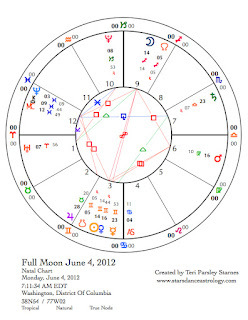 The chart for the Full Moon shows a mutable grand cross. This means every mutable sign in the zodiac has a planet in a challenging relationship with each other. The wonderful things about mutable signs are their flexibility in tough situations and their desire to understand everything. There is potential for a lot of this at this time. However, the challenge comes from the difficulty we may have in letting these qualities mature into focused action and stability. The primary axis of this lunar eclipse is Sun in Gemini opposite Moon in Sagittarius. We are called to align with the concepts of microcosm and macrocosm—what happens in the immediate environment is mirrored by what happens in the big story of what we think it all means, and vice versa. This alignment says, “Pay attention to all coincidences.” The cosmos is alive and communicating with us, and we too, are able to communicate back. Remembering your New Moon intentions, what is being communicated to you? Become aligned with this meaning for the good of all. Venus is also right there with the Sun. “Become what you love,” was the theme of Caroline Casey’s talk about Venus at the United Astrology Conference last week. I could get more complicated than that, but why? It is more than enough. Let us all shapeshift (Gemini) into what/who we love and use this to help us in our alignments. Gemini and Sagittarius are the yang mutable signs of mind and spirit. The yin mutable signs of Pisces and Virgo emphasize heart and dedication. Today, Neptunein Pisces is stationing retrograde giving a very watery and open feel to this Full Moon. From this open place, we sense the qualities that Chiron in Pisces adds to the energy, which is a sense of dedicating ourselves to helping everyone transition from wounds to wisdom. Mars in Virgo (dedication) is opposite Chiron (compassion) and is exactly square to Venus (shapeshifting into love). We will need all our tools to refine this energy into the alchemical elixir of bliss, but it is possible and worth trying. Tuesday, June 5. There has been a lot of anticipation for this day among those who follow the dance of the stars. The Venus transit of the Sun happens today. [To find out more about what this is.] In the CDT zone, the core of the transit happens at 8:27 pm, begins at 4:04 pm, and ends after sunset at 11: 49 pm. We are still within the energy of yesterday’s Lunar Eclipse with its mutable grand cross. It is as if Venus is the secret ingredient to the alchemical working. This planet of love, justice, wealth, and desire intercepts the Sun’s rays to give us the gift of wholeheartedness—wholehearted love, justice, wealth, and desire. Whew. It is even making my spine tingle! The Moon is in Capricorn at this time conjunct Pluto, further heightening the potential for transformation of base desires like greed into elevated desires like responsibility and stewardship. Wednesday, June 6. The Moon remains in Capricorn on a much quieter day than the previous ones this week. This is a good day to take care of business, climbing a little closer to your own mountaintop. June 7—Disseminating Moon: Sharing. In yoga practice we often dedicate any merit we have accumulated in our practice to others. This describes the urges of the Disseminating Moon—a desire to share the fruits of what we’ve experienced in this lunar cycle. Over the next three to four days, let yourself share some inner truth you’ver recently realized. Today the Moon moves into Aquarius, the sign of community. How do you share your visions in community? The Sun squares Mars today. This waning square was described by astrologer, Dane Rudhyar, as a crisis in consciousness. Today we might be challenged to think our way to perfection. If you are like me, that won’t get you far. Perfectionism is a mental construct that leads to shame. Recently, I’ve adopted the practice of telling myself “good enough” when I spiral into defeated thoughts of inadequacy. Mars in Virgo has been asking us to investigate how and why we serve and how and why we dedicate ourselves to a greater mission. Does perfectionism serve you in that work? Friday, June 8. Mercury in Cancer trines Neptune in Pisces today. I can’t imagine a better day to go for a swim. Let the waters take you. Saturday, June 9. The water theme of Friday continues today as the Moon moves in the mutable water sign, Pisces. Notice the relationship between mind and heart today and notice what you do when you feel over stimulated by mental activity. Water helps us to let go of doing and relax into being. This might be a wonderfully rejuvenating day if you allow yourself to be.